After releasing a hot freestyle titled #ClubRUC, @esojayluciano is here with another set of good dope music, something special for the girls& beautiful ladies and also something every body can relate to. Off his "SATURDAY NIGHT LIVE"(Series), as part of his preparation to release his Official Single. 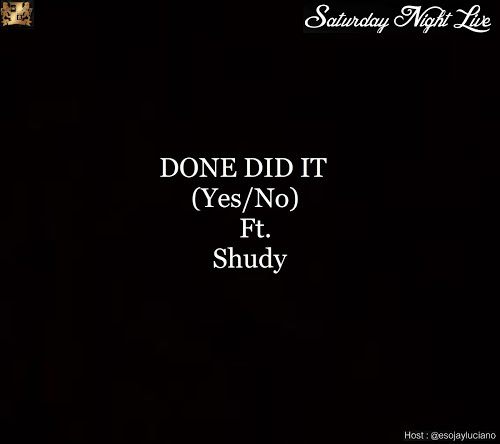 On these songs "Done Did It (@bankyw's YES/NO Cover)" & "Diamonds", @esojayluciano drops hot flows&bars with a feature from top notch vocalist- Shudy aka @thaboloman to create a melodious, rhythmic song, while the other song contains a vocal sample from @Rihanna's Diamonds. These songs are done over @bankyW's hit Song "Yes/No", & @Rihanna's Diamonds. As usual @esojayluciano did justice to the song. Its another dope @esojayluciano Song,& a must get.